南アフリカの固有科で灌木。Endemic family in South Africa. Small shrub. 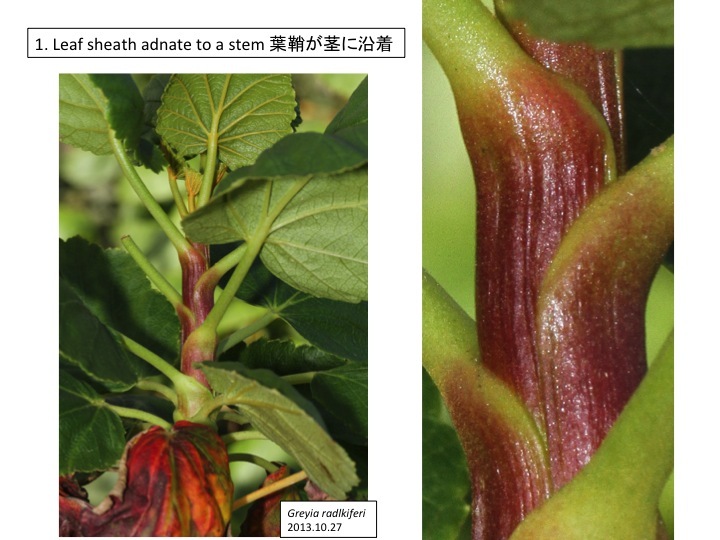 シロイヌナズナなどの葉を見ていると葉は葉身、葉柄、托葉だけからできているように見えるが、Greyia radlkiferiを見ると、葉は葉基 leaf baseの制御機構も持っていることがわかる。Greyia radlkiferi has conspicuous leaf base, which we often forget when we observe Arabidopsis. 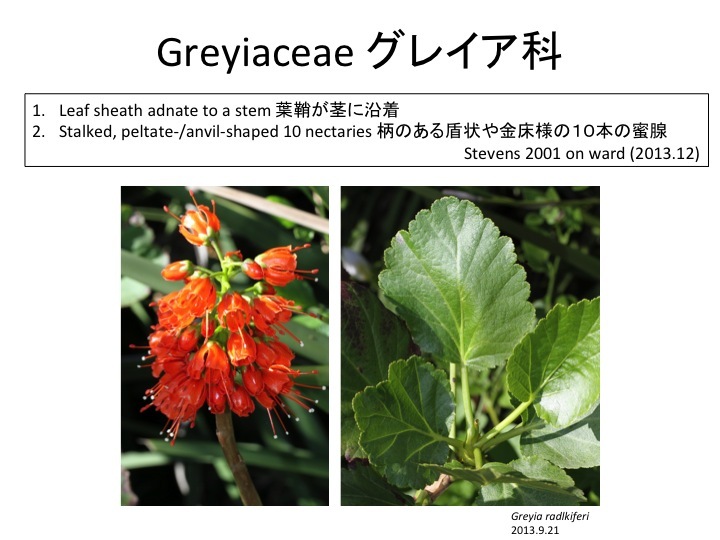 Greyia属は外側に5本の短い雄蕊、内側に5本の長い雄蕊の合計10本を持つ。 Greyia has 5 short outer stamens and 5 long inner stamens. Ronse Decraene and Smets (1999)によると、蜜腺原基は雄蕊の外側に生じるが、成長するにつれ雄しべの付け根を覆うように蜜腺と一体となって花托部分が盛り上がる。雄蕊基部周辺の組織は蜜腺ほど大きくならず、蜜腺基部を取り巻き、最終的に雄しべが蜜腺の穴から出ているようになる。Ronse Decraene and Smets (1999)に縦断面の写真があるが、花托組織の表皮と内側の数層の細胞が分裂活性を持って盛り上がっているように見える。蜜腺には師部細胞は形成されるが、茎の維管束と通じることは無い。維管束を形成する器官形成と維管束を形成しない器官形成には大きな違いがあるのだろうか？ユリ科やラフレシア属などで見られる花被上の突出構造との相違点は？Nectary primordia are formed outside of stamen primordia and then connected to growing receptacle tissue, which differentiate to surround the filament base (Ronse Decraene and Smets, 1999). Nectaries of Greyia only form phloem tissue which does not connect to stem vasculature. So far, we do not know genetic regulatory networks for nectary formation, which may be different from those in organ with vasculature differentiation. 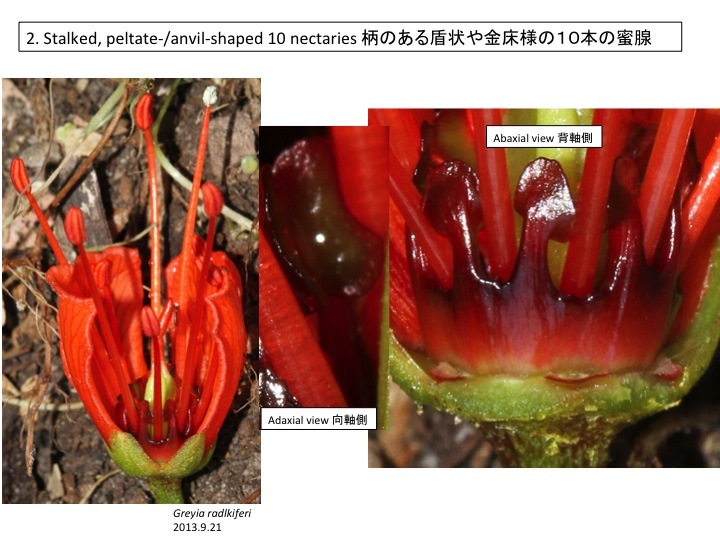 Are there similarities to protrusions on petals in Liliales and other? Ronse Decraene, L.-P., & Smets, E. 1999. 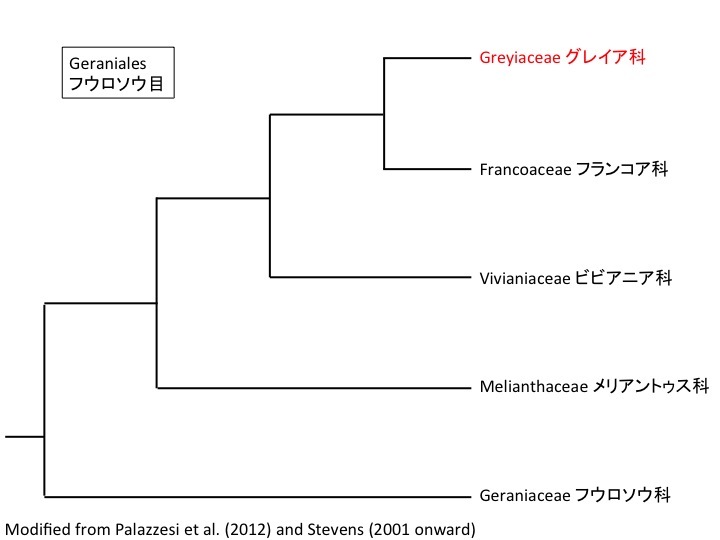 Similarities in floral ontogeny and anatomy between the genera Francoa (Francoaceae) and Greyia (Greyiaceae). Internat. J. Plant Sci. 160: 377-393.